Generally, gold deposits contain high weathered clay, which encloses gold-bearing ore to form a cement or mud. If the cemented mud is not broken, it will be removed along with the waste rock during the screening process, resulting in loss of gold. In addition, the cement can be cemented on gravel or pebbles. If it is not broken, it will also cause gold loss during the screening process. Soaking with water, rinsing and mechanical agitation dissociates the cemented ore and separates the gravel, sand, and clay, and washes the clay and gold particles adhering to the gravel. This process is washing. The gold mine washing operation includes three processes of crushing, sieving, and de-sludge. It is a very important operation before the gold deposit. This work is important because it not only separates the mud and sand, but also removes the gold particles adhering to the gravel surface, and can screen out a large amount of gold-free gravel and discard it directly; the general yield can be 40%-50% of the ore supply, reducing the processing capacity of the beneficiation, improving the gold grade, and removing most of the slime, improving the sorting performance of the gold deposit, which is conducive to the improvement of the gold deposit. Select recycling indicators. The ore is excavated from the stope, transported into the original mine silo, and passed into the jaw crusher through the plate type feeding machine for crushing work, and then transported to the powder mine bin for storage by the belt conveyor. Through the sieving effect of the broken ore through the linear vibrating screen, two kinds of commodities on the sieve and under the sieve are formed. 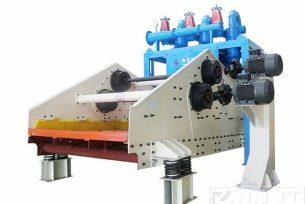 The sieve material is sent to a lattice ball mill by a large angle belt conveyor, and the ore processed by the grinding is sieved back from the head by a linear vibrating screen. The vibrating screen is passed through a pipe into a wear-resistant hydrocyclone. By the cyclone classification, the qualified ore is discharged from the cyclone through the cyclone overflow to the next period, while the oversized aggregate is discharged from the underflow and mixed with the sieve of the linear vibrating screen to enter the ball mill from the head. Through the above procedure, the ore is ground to -200 mesh 60-70%. The ultra-fine lamination self-grinding machine used during crushing, grinding, grading, grinding, and grading, a section of open-circuit crushing and one-stage closed-circuit grinding technology greatly shortened the entire process. The primary equipment includes jaw crusher, ultra-fine lamination self-grinding machine, lattice ball mill, wear-resistant rubber pump and wear-resistant cyclone.